Our family is grieving. Our beloved golden retriever, Scout, has died. It’s hard to describe this loss, because you would have to have known Scout and what he meant to our family to understand. This is more than the passing of a pet. Our boys grew up with Scout. He was a part of our family. Not merely because of our affection for him — affection can raise the status of a stuffed rabbit to something special. Scout was special. He had a huge heart and a sensitive spirit. He was loyal and true. Always happy to see you, always game for whatever was afoot. He slept in the boys’ bedroom. He took walks with Stasi every morning as she said her prayers. He always was at the door when we got home from the day, barking hello, tail wagging. Scout loved to run through the snow with his nose down in it. He loved to chase birds. And our ATVs. He’d sometimes come up to S’mores [our horse], and when S’mores would bend his tall head down to inspect him, Scout would give him a lick on his nose. He’d want to play ball with you, but he’d never want to give you the ball. And if you were sad, he’d come up to you, gently, lovingly, tail wagging. He’d nuzzle his face close to yours and comfort you. He could tell. We were sad last Monday night. Really sad. The cancer that had shown up last summer had returned, with a vengeance. The vet gave Scout a month at best. But we could tell he was fading fast. And we didn’t want him to suffer. He was having a tough time getting up to go outside to relieve himself. He was yelping in pain in the night. So we talked with the boys Monday night about putting Scout down before the cancer got to the point that we could no longer manage his pain. We all wept. And Scout — who had been unable to get up the entire day on Sunday because of the cancer in his shoulder — got up and came into the family circle, began to come up to each one of us, tail wagging. It was as if he were saying, “It’s okay. It’s going to be all right.” Here he was, comforting his family right to the end. I cannot tell you how much I wanted to be able to pray and heal Scout. But you have to be so careful with your heart and your faith when it comes to healing prayer. It’s so important to know what God is up to. When the disciples asked Jesus about a man born blind, Jesus said the man had been born blind so that the work of God could be displayed in his life (John 9). And right then and there He healed him. But there were a lot of blind people in Israel at that time whom Jesus didn’t heal. So a few weeks ago I began to ask, Jesus, do you want to heal Scout? Is that what you want to do here? I sensed the answer was, No. Not this time. In learning to hear the voice of God, one thing is certain — if you cannot hear a “no,” you will have a hard time hearing God at all or believing that what you think you’ve heard is in fact from God. 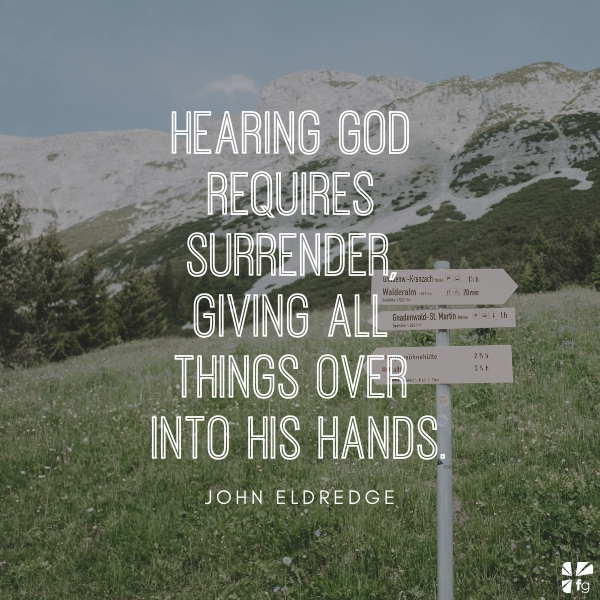 This is crucial — hearing God requires surrender, giving all things over into His hands. Not abandoning your desires, but yielding them to God. Of course I wanted to hear Jesus say, Yes, I will heal him. I wanted to hear that so badly. Then I would have gone after healing prayer like a man on a mission. I would have prayed like Elijah. But I could not do that to my family unless I knew God was fully in it. I didn’t want to drag them through that. But was I just making excuses for my unbelief? I turned to Romans 4. I’m not quite sure why. But as I read I knew God was speaking to me. Yes, that is how I want to live. That’s the kind of faith I want to exercise. Without weakening in his faith, he faced the fact that his body was as good as dead. That’s the key issue right there — Abraham’s faith was based on a clear and specific promise of God. We did not have God’s promise that Scout would live. I asked God long and hard about that. When it comes to our faith, we have to be careful that our earnest hopes and desires don’t cause us to claim a promise God has not given. Sometimes well-meaning people will do this on your behalf. Out of their love for you, desperate to offer encouragement, they will come to believe that their desire is what God is promising. A lot of mistaken prophetic words come from this desire. They are not the same thing. Of course our friends wanted Scout to live. I wanted him to live. But I did not think we were going to get a miracle this time. And so I prayed, Jesus, be with us in this. Help my sons to grieve. Comfort us. I bring the kingdom of God over Scout’s passing. I forbid any foul thing to be a part of this. Heal our broken hearts, Lord. Come into this. For more on this topic watch Video 9 at RansomedHeart.com/WalkingwithGod.